The following post is written by Katie, Christine's recently added right hand dog person at oh my dog! When I first brought Sandy home from the SPCA, one of her great “pre-programmed tricks” was bringing me her food bowl when she deemed it feeding time. "Will do tricks for food"
**It should be noted you must take extreme caution leaving your dog alone with any toy, and NEVER an untested one. You should monitor their interaction with it until you are certain they will not chew off any pieces. 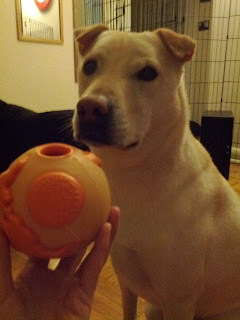 Sandy's stoic approval of a Planet Dog toy. See the "treat spot" on top. 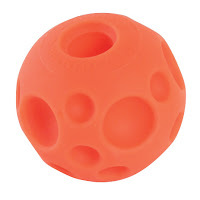 If you just want to keep your dog busy through the day, you may be fine with any number of products, from the line of stuffable Kongs to any Planet Dog toy that has a “treat spot”. 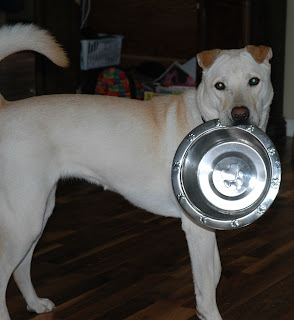 Basically most toys that can have kibble/canned food/peanut butter/food-item-of-choice in them and licked out by a dog. This is great for lots of dogs, and can keep them busy for hours. Both products mentioned have a lifetime guarantee, and Planet Dog also donates money to Therapy & Assistance Dog Programs, which makes them one of my favourites to purchase products from (read more about the programs they support here). From here on in, however, we are going to cover food dispensing toys instead of food stuffing toys. 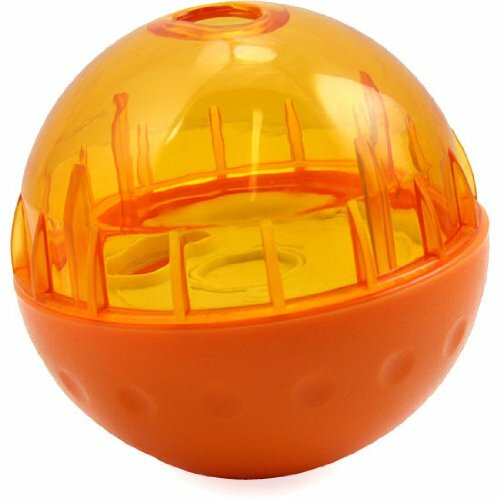 The Tricky Treat Ball is a good food dispensing toy as your dog has to engage with the toy by pushing it around to get the food to come out. This product is straight forward, good for dogs who have no background in getting food out of toys, and can keep a dog busy, but is made of a softer plastic and not recommended for dogs who chew on their toys. 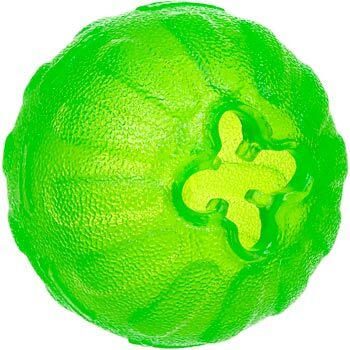 Smarter Toys makes a product called IQ Treat Ball. It allows you to pick the size of the opening the kibble passes through, so you can start off with a bigger opening and then increase the difficulty once they get the swing of things, or depending on how big/small the kibble is. It’s middle-of-the-road thinking for dogs, a good intro food dispensing ball, and the plastic casing can be chewed in to by heavy chewers (we have the teeth marks to prove it), so only recommended for dogs who don’t get carried away with their toys, but it can still withstand a beating. Canine Genius makes a great toy, Leo, which can be bought in multiples and connected together or used on its own. 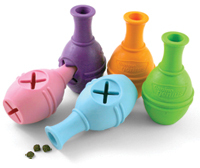 It’s a pretty difficult toy depending on the size of the kibble and how you use it – lots of options here. I really enjoyed this toy…until my dog got frustrated and chewed the top off to get to the treat inside. That one was my fault, as I stuffed it with peanut butter and soft food instead of kibble that would be easier to dislodge. A lesson I learned so you don’t have to – food dispensing toys are to dispense, not to stuff. There are only three toys that have survived the jaws of my ferocious chewer: The Everlasting Fun Ball, the Buster Cube, and a newer addition, the Kong Wobbler. My favourite recommendation is the Everlasing Fun Ball. I own two that I purchased in 2008 and are still seeing active duty. It is a malleable ball, apparently made from “elastomer-type material”, and can be very challenging, depending on the size of kibble. The Buster Cube is the recommendation for dogs with brains that will chew things in to pieces. Again, not recommended to leave alone with your dog if that is their habit, you don’t want ingestion of any of the pieces. The Kong Wobbler is great because it comes in varied sizes and the odd shape makes it awkward for a dog to put in their mouth. I've seen comments that dogs are able to open it up, but we haven’t had that happen yet. There are a few different products similar to the Wobbler on the market, just make sure your dog can't fit the top in their mouth and the material is a sturdy, hard plastic. My best recommendation for Hard Chewers is to make sure the toy is in proportion to the dogs’ head (therefore they cannot easily fit it in their mouth) and made of hard plastic - if you can knock on it and not squeeze it, that’s what you’re looking for. An additional note: Remember that the rate of reinforcement for your dog to interact with these toys needs to be such that they don’t get frustrated and walk away. 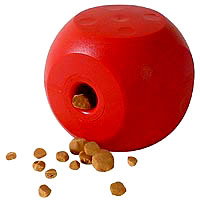 If kibble is too big to be released, your dog will get little to no pay off, alternatively if the kibble is too small it will all tumble out with next to no work - both cases completely defeating the purpose of the toy. You want your dog to work AND be rewarded! **update** Whole Dog Journal just published this great article about some of the best interactive dog toys!